Bradley P. Tolppanen, Churchill in North America, 1929. Jefferson, N.C.: MacFarland, 2014, 272 pp., paperback $45, Kindle edition $29.99. With so much now published about Sir Winston, many believe the only “new” books that can be published on the subject are either violent attacks or specialized studies. 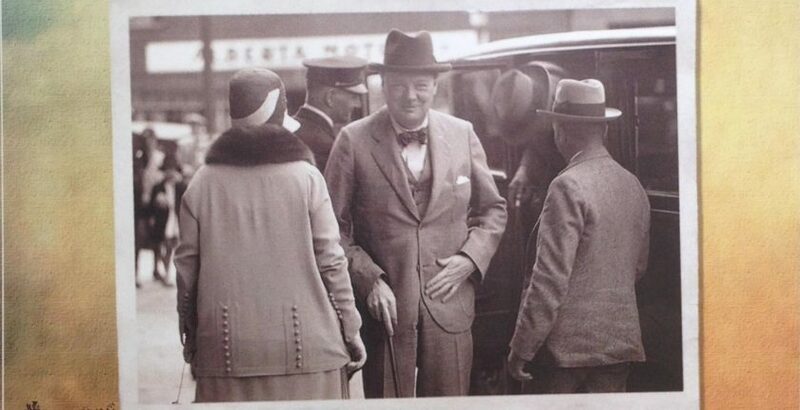 They don’t come any more specialized than this detailed survey of Churchill’s North American tour between August and October 1929, finishing with a climacteric on Black Thursday, October 24th, when Churchill watched the New York Stock Market crash. Tolppanen’s closely set, admirably footnoted and illustrated text gives virtually an hour by hour account of the journey. Winston and Jack Churchill and their sons Randolph and Johnnie, traveled across Canada from Quebec to Vancouver, thence down through California, cross-country via Yosemite to Chicago, and finally to New York. They saw venues from slaughterhouses and lumber camps to the Hearst castle at San Simeon; they met Herbert Hoover, Mackenzie King, Bernard Baruch, Marion Davies and Charlie Chaplin. On the New York visit, Tolppanen brings out several interesting facts. For example, Churchill would have met Roosevelt for the second time before World War II, had FDR been in town to attend dinner at Bernard Baruch’s. (Would FDR have then revised his 1917 impression of Churchill as “a stinker”?) Or Churchill’s optimism that “all will come right”: late on Black Thursday, he gazed out his hotel window at the hive of activity in New York harbor and the vast smokestacks of industry on the Jersey shore, concluding that come what may, the United States would survive this meltdown. One downside to this book is the lack of extensive quotes by Churchill himself, possibly limited by copyright restrictions. Of course, Hillsdale College Press can amplify this by providing virtually every significant thing he had to say in Document Volume 12 of the Official Biography, so it’s not like Churchill’s contemporary impressions are lost to history. Then there are his own subsequent writings, notably the twelve-part newspaper series, “What I Heard and Saw in America” (1930), reproduced in The Collected Essays of Sir Winston Churchill (1975). What Tolppanen has done is to fill in the details for virtually every day. When it was suggested that only a handful of readers would actually sit down and read his document volumes, official biographer Martin Gilbert said it didn’t matter: “What matters is that nobody can essay this period without referring to those volumes.” So it is now with the journey that taught Churchill much about Canada and America.